It is with a great sense of pride and achievement that we announce the official opening of our walk, today at 2.30pm sharp at the Knockanure road entrance. Everybody is welcome along. It was spoken of many times pre-1995 but it was ‘Leader-2’ which kick started a plan to develop a walk connecting both woods. Permission was sought and granted from the owners involved (to whom we are very grateful) to proceed with our plan for ‘Leader’ funding. This was unsuccessful, so we approached Ogie Moran, who introduced us to the North Kerry Walks Committee and the rest you might say is history. It is only fitting that Tom Finn, their chairman, performs our opening today, because from our first meeting in an overgrown wilderness (which is now a walk the whole community can be proud of) it was encouragement all the way, positive advice and finance to back it up. We appealed to volunteers to make an attack on all the rubish, fallen trees, and to scrub both woods of briars and bushes commencing on Easter weekend of 1996. Our call was answered and over the next number of weeks we removed 150 tons of rubbish with the help of 145 voluntary hours, all of which we are all very thankful to. The walk was open to the public on 1st June 1996. In April ’97 we applied for an Amenity Woodlands Grant, which was successful and we are now awaiting payment of. In conjunction with National Tree Week in ’98 we planted the first of 1200 trees with the help of Fr O’Leary and a number of local school children. Our next big task was to lay a pathway throughout both woods, (which because of the atrocious Summer, took until Autumn) this was completed with the help of our FÁS workers, 80 voluntary hours and took 30 loads of pencil, blinded with 5 loads of limestone dust. In Dec. ’98 (with the help of Kerry County Council) we re-routed a stream, removed a ditch and erected a wooden fence at the Knockanure road wood. The public footpath is now being extended here. The picnic areas at both woods were reseeded, trees, shrubs and hedging were planted, and route maps were erected. Some more planting of flowers, shrubs and trees remains but we see this, along with routine maintenance as an ongoing task. Moyvane Developement Association would like to thank all our sponsors, landowners, voluntary workers, FÁS workers and anybody who gave a hand to make this day possible. 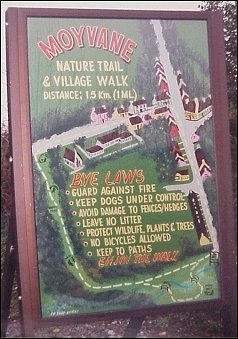 We wish all the visitors and the local community a pleasant and enjoyable walk.